The city’s annual Zombie Walk – which was postponed last year to make way for the Big Sleuth art trail – has been indefinitely put on hold, according to fundraisers at the Birmingham Children’s Hospital Charity. 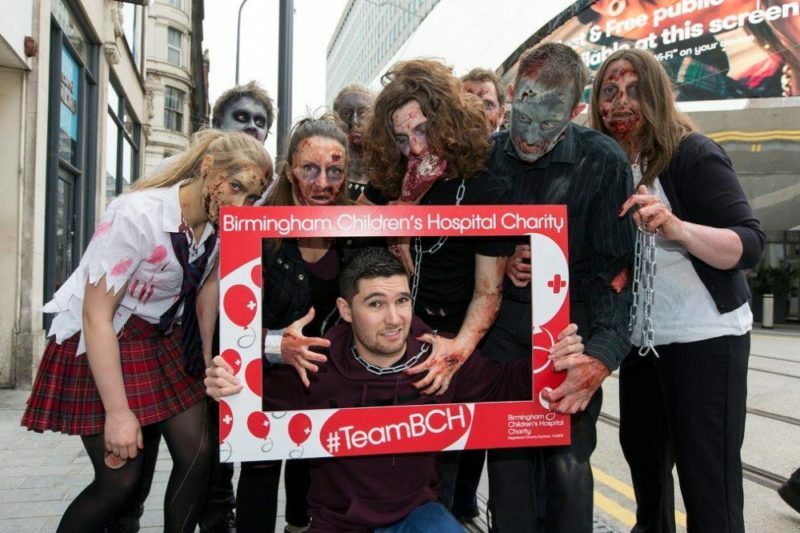 The fundraising event – which has raised thousands of pounds for the hospital – brings together hundreds of individuals dressed in horror-themed costumes for a day of dress up and fun activities, before participants engage in a walk (or shuffle) around the city centre. Traditionally held in either Summer or Autumn, the future of the flashmob-style gathering is now uncertain, after the hospital’s events team confirmed it was once again being cancelled this year, and might be shelved next year too. 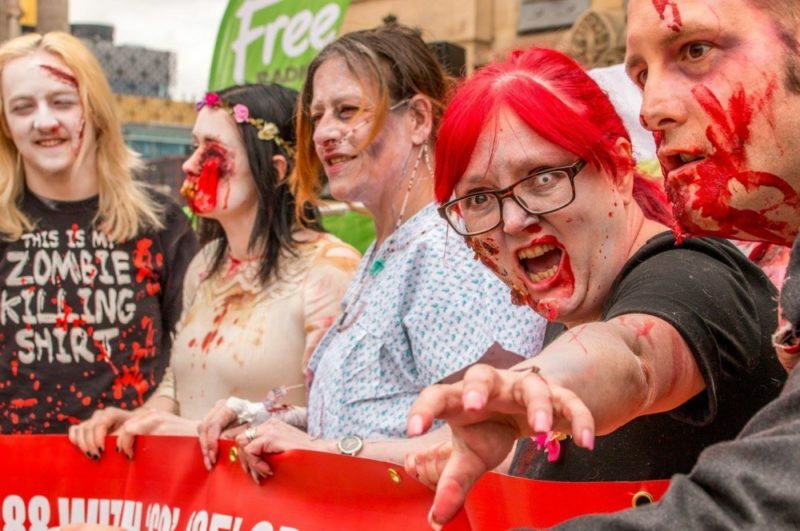 According to hospital charity fundraising team member Marie Weaver, the “Zombie walk has been discontinued at the moment,” and “Nothing has been marked for this year or 2019”. 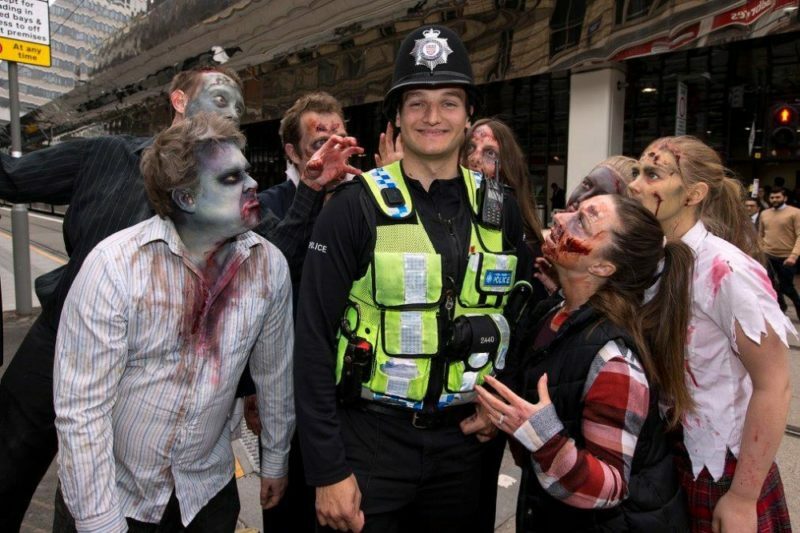 The Birmingham Zombie Walk was launched in 2009 in City Centre Gardens by Jamie Chapman, a teenager at the time, as a social get-together with a charitable element. It fast became very popular with horror fans, cosplayers, YouTubers and Zombie enthusiasts. In 2011, Jamie joined forces with event volunteer Adam Yosef to create Punk Zebra, a film and events company which thereafter managed the Zombie Walk. A special one-off Zombie Ball was held the same year at the Birmingham Ballroom, where it sold out. Profits of £1,400 from the night were donated to St Basils. The Zombie Walk continued as an annual attraction, becoming larger each year, with thousands attending. Volunteers from across the city came to help with stewarding the event, while make-up artists and college students also joined in to help create special effects for ‘zombies’, in exchange for a donation. Several businesses – from Monster Energy drink, the Oasis alternative fashion store and Hollywood Monster to local printers, bars, cafes, music venues and costume hire companies – came on board to give the fundraising event a boost. Prizes were also donated for a special raffle, as an additional fundraising incentive. By 2013, local radio stations including Kerrang! and Free Radio were lending their support to the walk, with celebrity backing from the likes of Kate Lawler, Johnny Doom, Jo & Sparky, singer Beverley Knight, band Strangle Kojak, stars of The Apprentice; and from Shaun of the Dead lead actor Simon Pegg. 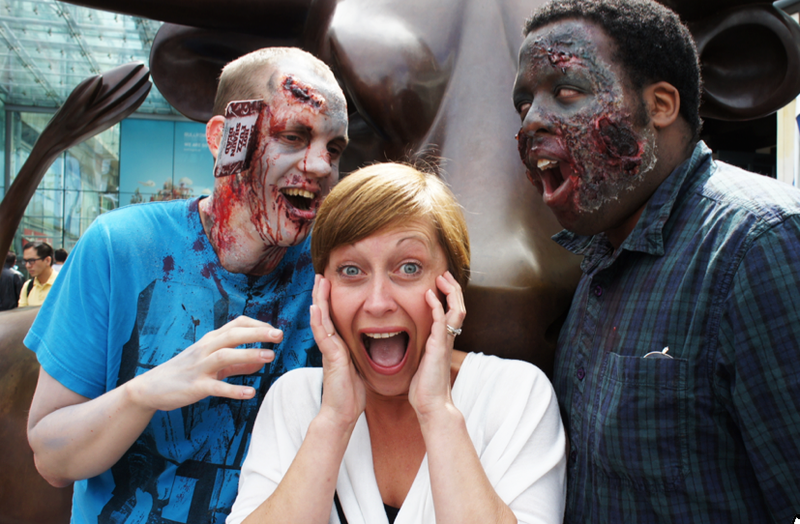 The ‘Birmingham Zombies‘, as they came to be known, had so far raised over £15,000 for the hospital. 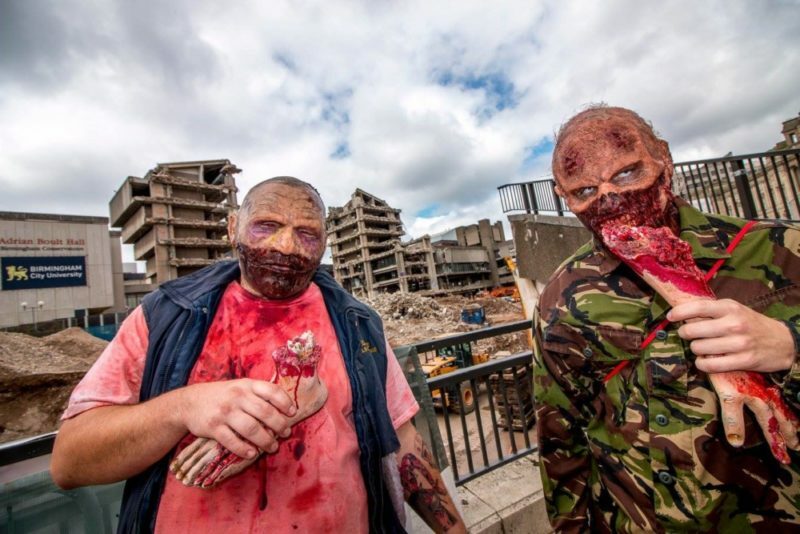 In August 2013, Zombie Walk founder Jamie Chapman and co-organiser Adam Yosef were profiled as “Charity Champions” by the Birmingham Mail, and featured on the cover of Say Optima! community magazine. 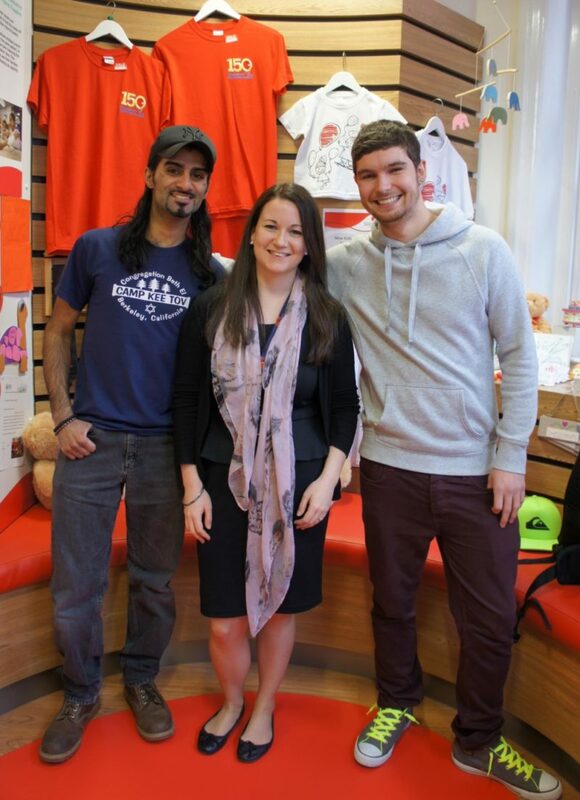 In 2014, Birmingham Children’s Hospital co-produced the event, securing an official partnership with Free Radio. The event was moved to Centenary Square, and promoted with a tie-in film screening preview event at Millennium Point and a Halloween ‘fright night’ at the Library of Birmingham. A follow-up Halloween event – dubbed “ZomBall” was also held at Alfie Birds, in association with Yelp Birmingham and the Mockingbird Theatre. During the same year, Jamie Chapman was awarded with an Inspire Birmingham Award for ‘Young Fundraiser of the Year‘, and accepted a ‘100 Heroes’ award from the Birmingham Children’s Hospital. In 2015 and 2016, the hospital fundraising team officially took over the event, which was then held in Victoria Square to accommodate city centre construction and roadworks. The format remained the same, with make-up tents, outdoor games, food and drink, competitions, music, banner making workshops; and the main walk itself. Free Radio presenters Andy Goulding and Adam Wilbourn compered the mini-festival. 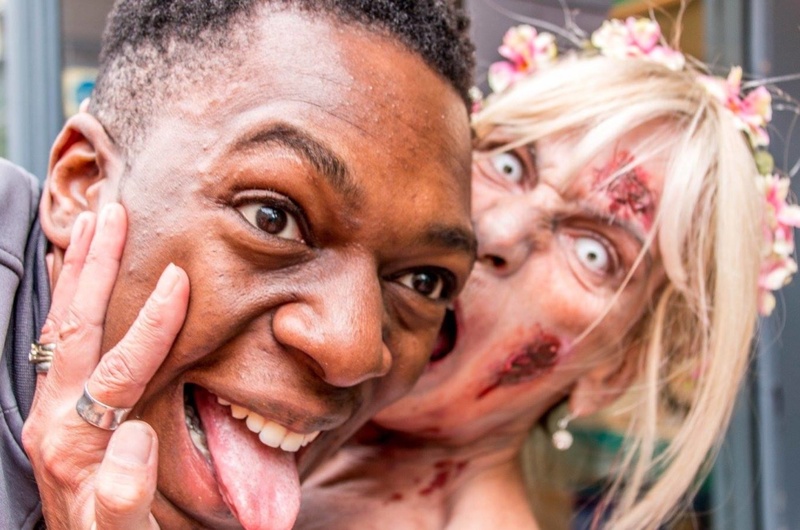 For 2016, the Zombie Walk partnered with local transport for an eerie Midland Metro takeover, as spooky ‘zombies’ smeared in fake blood and wearing torn clothes, spent a day riding the new trams between Birmingham and Wolverhampton. Jamie Chapman and Adam Yosef were also both nominated for the hospital’s ‘100 Heroes’ awards that year, with their names prominently displayed in the hospital’s fundraising hub. In 2017, the hospital announced that the Zombie Walk has been postponed for a year to allow time to focus on other summer fundraising activities; but it has since confirmed a temporarily discontinuation of the event. Although the tenth Zombie Walk would have taken place this year if continued as normal, next year also marks the official ten-year anniversary of the walk. 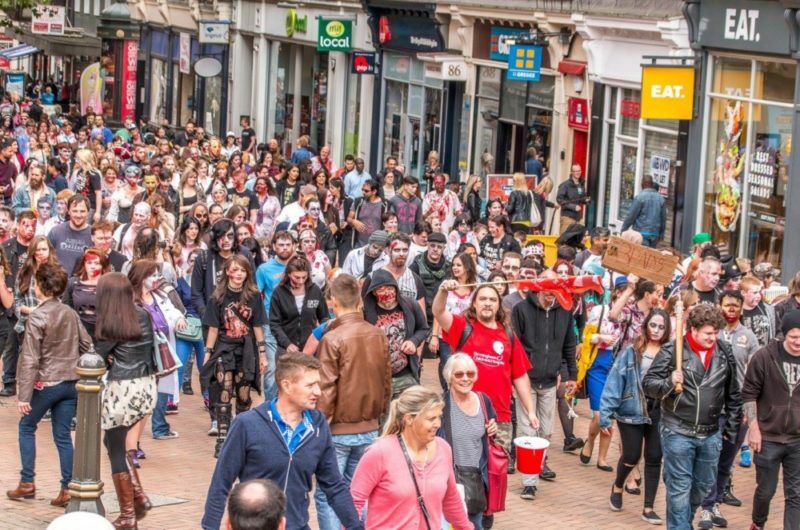 “It’s a real shame to hear that the Zombie Walk won’t be continuing this year and possibly in 2019 too, as it was a fun, family event that brought people together for a great cause right in the centre of the city. “I just want to thank everyone who supported the event, including the volunteers, the team behind the scenes and of course, those who attended over the years. 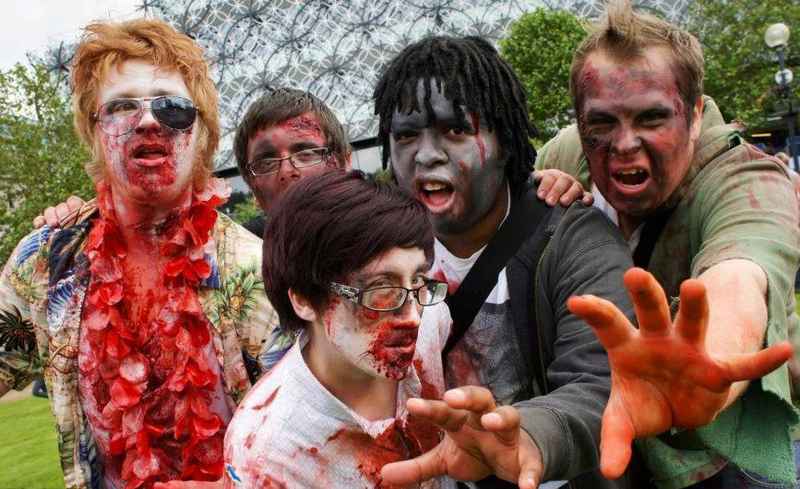 I would like to see the Zombie Walk return to Birmingham at some point in the future, even if it’s in the form of a slightly different event to what it has been in the past. “The events team at Birmingham Children’s Hospital took over the organising and did a terrific job of putting the event together during 2015 and 2016. With the event growing like it did, it took a lot more organisation than it used to back in 2009 when the first Zombie Walk took place. 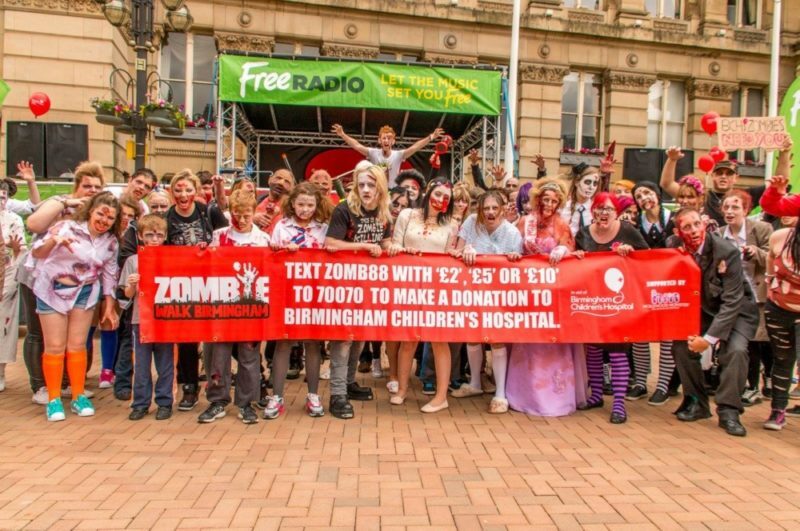 We contacted the Birmingham Children’s Hospital Charity for additional comment but were unable to confirm if and when the Zombie Walk would return, or if it would be passed onto another team in future.